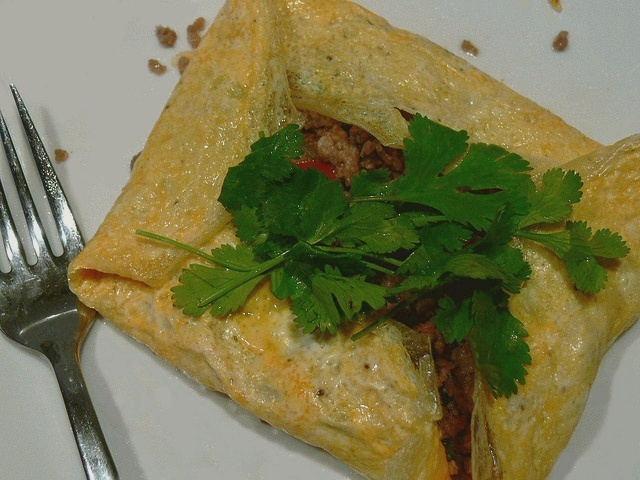 Individual omelettes can be made or make two large omelette parcels to serve 4. They are remarkably easy to make a tasty lunch or light supper. Similar recipe – Nasi Goreng Pattaya. Heat oil in wok or frying pan. Add chopped garlic, and onion and fry for 3-4 minutes until the onion is softened. Add the minced chicken and stir-fry for 7-10 minutes untill broken up and lightly browned. Stir in nam pla sauce, sugar and chopped tomatoes, with pepper to taste. Simmer for 5-8 minutes until the sauce thickens. Remove from heat and stir in chopped fresh coriander. Make the Omelettes: Whisk eggs and nam pla in a bowl. Heat a little of the oil in a 20 cm omelette pan. Add a quarter or half of the egg mixture, depending on whether you wish to make individual parcels or cut them in half. Tilt the pan to spread the egg into a thin even sheet. As soon as it sets, spoon some filling over the centre of the omelette. Fold the top and bottom over, then the right and left sides to make a neat, square parcel. Variation: Replace half the minced chicken with peeled tiger prawns or white crab meat. That omelette looks so good, its making me hungry just looking at it.